I think there's some real magic behind the sight of a city's skyline. I remember with great fondness driving into the city with my family when I was young. Driving west to east on the Gardiner, we would get closer and closer to Toronto. First the buildings seemed distant and tiny, despite their obvious height, and the CN Tower commanded the attention. As we'd drive closer and closer, excitement would boil inside my belly. The buildings would grow in their imperial glory until finally, we would be right within the busy hustle of the city. Trips to the city were rare back then, a novelty I long for as I'm now in the city every single day. I find the city exhausting but I also feel that if I'm gone for too long, I begin to miss it. This love-hate relationship has allowed me to recognize the skyline to symbolize that moment before entering the city. It's the beacon of peace before being immersed into the loud and noisy place we call Toronto. The CN Tower hails as Toronto's chief captain. No matter where you are, you can catch a glimpse of it. I use it as my compass when navigating through the city. And when viewing the city skyline from a distance, you see the CN Tower and its notable form sandwiched between all of the other buildings. The CN Tower is what separates our skyline from that of any other city's. While the skyline can be viewed from multiple locations, one of my all time favourite spots is at the top of the hill of Riverdale Park. I first discovered this view of the city in 2014. A good and adventurous friend of mine had wanted to go explore this park and we ended up finding the Rooster Coffee perched right at the top of it. Our school picnics were often located at the bottom of the field, but having to stick with our class, we'd never ventured atop the hill. Little did we know that up there we would be exposed to one of the city's best viewpoints. 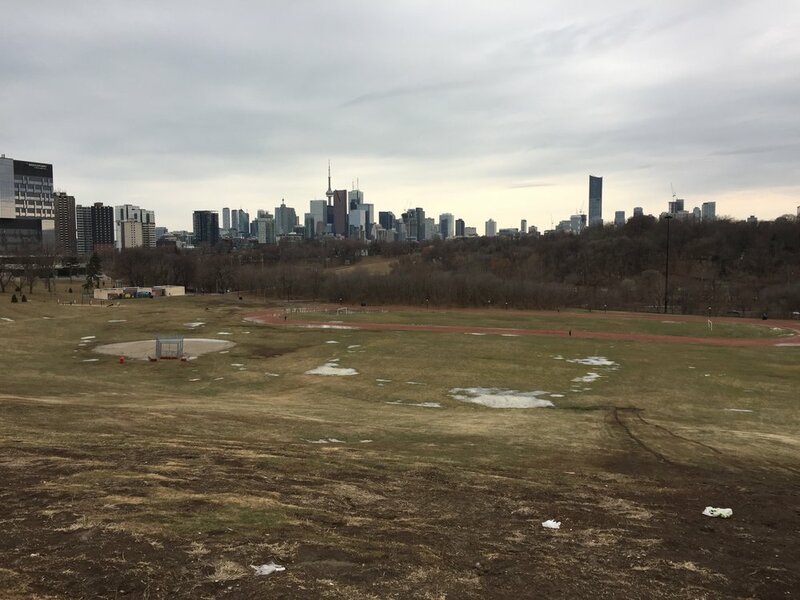 Riverdale Park defines the border between Cabbagetown and Riverdale, two of Toronto's eastern neighbourhoods. I began to frequent this hilltop more and more when I had foreign friends come visit me and more recently when my sister and her family had lived in a house just next to it. Rooster Coffee (this location) is idyllic and the baristas are so friendly. You really get the feel that everyone knows each other in Riverdale. Many people gather on this hilltop. Families having picnics, runners sweating as they do laps up and down the hill, those waiting for the 504 streetcar, young romantics watching the sun go down. I'll often come here with a good book and tea from the cafe, timing each sip to match to moment the sun meets the horizon. I love this spot, and most viewpoints for that matter, because it holds a sort of tranquility - you stare right at the city skyline which represents a city so busy there isn't a second to relax, and yet, you're somewhere completely worry free and peaceful. We often associate needing a break from the city as going somewhere far away, like the cottage or the beach, but we neglect to recognize how near we can be to spots like this. Sometimes the best meditation can come from actually seeing the very thing you're escaping and realizing that you are in fact away from it. That's what I get from looking at the skyline. The distance becomes my reward.